Recently I was adding a second drive to my laptop and I was extending the partition on the old drive to use all the space. During the extending it error ed and I lost the partition. So I found some tools and tried to recover some of the files. Well after running the supposedly free tool for about 8 hours it found all the files I wanted to save. The popped up the warning saying it would only recover a Gigs worth of files. That was no where what I needed. So I looked into buying a tool. After an hour of looking most tool were anywhere from $100 to $500. Well I didn’t want to spend that much on a tool I would use one time. I did some more searching and found this tool called TestDisk. This tool recovered the partition and best of all was free. So I gave it a shot. In about 5 minutes I had my files back and the drive was up and running. The tool it a portable app and it is a command line tool but it works great. Here are some pic of the interface and a brief from the Pendriveapp.com website it is hosted on. TestDisk is a Free Portable Data Recovery Software tool. The tool was designed to help recover lost partitions and or make non bootable disks bootable again. 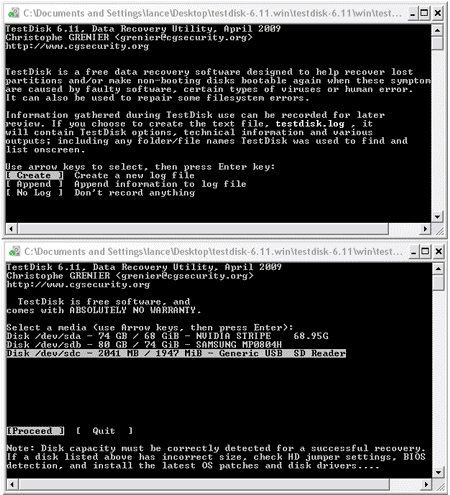 TeskDisk is particularly useful when a system is not bootable because of a virus, software, or human error (accidentally deleting a Partition Table). This tool can fix a partition table, recover a deleted partition, rebuild or recover NTFS, FAT boot sectors, fix MFT, undelete and or copy files from NTFS, FAT, ext2, ext3 partitions. Backup recovery is also supported. If you need to recover deleted files you may want to try Portable Data Recovery also. This is also a free portable app that recovers deleted files. You can find this at Pendriveapps.com as well.